Background Cerebrovascular stroke (CVS) is a neurological deficit lasting for more than 24 h and occurs as a result of interrupted arterial blood flow to parts of the brain. One of the most common complications following CVS is dysphagia which is a biomechanical disorder that occurs when functional impairments of the nervous system or musculature impede the transport of liquids and solids to the gastrointestinal tract which may increase the risk of morbidity due to malnutrition, dehydration, and aspiration pneumonia accompanied with dysphagia in stroke patients. The swallowing training program is expected to reduce the risk of complications related to dysphagia. Aim The aim was to determine the effectiveness of swallowing training program on dysphagia following CVS. Patients and methods A quasi-experimental design was used. This study was conducted at the neurological inpatient units which were affiliated to Ain Shams University Hospital. A purposive sample consists of 40 hospitalized, CVS adult patients from the previous mentioned setting. Two tools were used for data collection: (a) Patients’ structured interviewing questionnaire, which included the patients’ sociodemographic and clinical data and (b) swallowing observational checklist which included two parts, (i) assessment of oral motor structures and reflexes and (ii) swallowing rating scale. Results At the fourth observation for dysphagia manifestations, the present study revealed that more than two-third of the studied patients during their swallowing for potatoes, custard, teaspoon of water, eating biscuits, and sips of water were reached at L7 (normal swallowing). This study concluded that the training program of swallowing for dysphagic patients poststroke is effective in improving patients' swallowing. The program proved the effectiveness of the compensatory postures and oral motor exercises for those patients. Recommendation Develop continuing in-service training programs for nurses who work in the neurological units on the assessment of dysphagic patients, the compensatory postures, and oral motor exercises to be carried out with dysphagic patients. Cerebrovascular stroke (CVS) is a sudden loss of functions resulting from disruption of blood supply to a part of the brain (American Stroke Association, 2017). The CVS is the third leading cause of death in the USA and the most common cause of long-term disability in adults. More than 150 000 people with stroke die each year. There are ∼5.5 million CVS survivors in the USA and it is estimated that about 13 million individuals have sustained the so-called ‘silent’ stroke (American Agency for Health Care Policy and Research, 2016). Stroke can be divided into two major categories: ischemic and hemorrhagic (Amy and Collins, 2015). The American Stroke Association reports that the majority of strokes is ischemic and account for 88% of all strokes. In ischemic stroke, the blood flow is interrupted by total or partial occlusion of a cerebral artery by a thrombus or an embolus (American Agency for Health Care Policy and Research, 2016). Hemorrhagic stroke results from extravasation of blood in the brain tissues or into the subarchanoid space. Stroke can affect any part from the four parts of the brain: right hemisphere, left hemisphere, cerebellum, or the brain stem (Carr and Shepherd, 2012). The CVS disturbance affects many body functions namely, neuromotor activity, eliminatory, intellectual, sensory, and communication functions. A common deficit caused by stroke is dysphagia (Grodner et al., 2017). Dysphagia affects up to 80% of stroke victims. Dysphagia refers to difficulty in swallowing resulting from the disruption in the swallowing process (Ramsey et al., 2013). Dysphagia or difficulty in swallowing is a symptom of a disease and it is not generally considered a major cause of mortality, but its complications are the most common causes of death. These are malnutrition, dehydration, and aspiration pneumonia. Stroke patients are the most at risk of these complications (Kim, 2015; Hines et al., 2016). There is no pharmacological treatment for oropharyngeal dysphagia. The main management is rehabilitation. The goal of swallowing rehabilitation is to reestablish safe oral feeding to a level that is as normal as possible. The swallowing rehabilitation program begins after a detailed swallowing evaluation has been completed. Swallowing dysfunction and its complications are common in stroke patients, thus the swallowing function should be assessed in all acute stroke patients. Based on the nature of the swallowing problems the rehabilitation program is implemented (Ultra-Mobile Personal Computer Swallowing Disorders Center, 2015). The components of the rehabilitation program for dysphagic patients are multiphasic. They comprise dietary modification which is modifying the consistency of solids and liquids for their easy and safe swallowing; postural changes of the head and neck to facilitate the bolus flow by gravity; introduction of swallowing techniques which are used to prevent pocketing of bolus and protecting the airway; oral motor exercises designed to strengthen and coordinate the oral structure muscles (Hebert, 2016). Effective dysphagia rehabilitation requires a multidisciplinary team approach, in which the nurse is an integral member. Identifying swallowing difficulty in stroke patients is an important task in nursing care, this implies that care needs to be adapted and when rehabilitation strategies are applied they reduce the risk of complications related to dysphagia. Frequently the nurse is the first health team member to detect, assess signs and symptoms of dysphagia. Consequently, the nurse has her/his role in managing the patient’s mealtime, documenting progress, teaching safe feeding practices, and in reinforcing the compensatory strategies for successful rehabilitation (Hines et al., 2016). Assessing dysphagia manifestations among stroke patients. Developing and implementing swallowing training program. Evaluating the effect of swallowing training program on dysphagic stroke patients. The study sample was recruited from the neurological inpatient units which were affiliated to the Ain Shams University Hospital. 1–2 days of acute stroke. With no receptive dysphasia or aphasia. Two tools were developed by the researchers to collect the data for this study. Tool 1: patients’ structured interviewing questionnaire which was concerned with the patients’ demographic and clinical data such as name, age, gender, date of admission, previous CVS, previous hospitalization and diagnosis, etc., after reviewing the related literatures based on Hinkle and Cheever (2014) and Hineset al.(2016). Part 1: assessment of oral motor structures and reflexes: This part was developed and modified by the researchers to assess the oral motor structure and reflexes related to swallowing namely: lips (four items), tongue (three items), and jaw (one item) as well as assess the following reflexes (three items) which include the swallowing reflex, gag reflex, and voluntary cough after reviewing the recent related literatures based on Kumaret al. (2014); Kim (2015) and Joundi (2017). Regarding assessment of oral motor structure and reflexes. The total score for this part was 11 degrees; 1 mark was given for Yes and 0 for No. The points were summed and converted into a percentage scoring; the total scoring system was classified as unsatisfactory level (<60%) and satisfactory level (>60%), because the patients who had a diagnosis of CVS suffer from many physical and psychological disorders that affect their functional status, so that the satisfactory level is considered from (>60%). Part 2: swallowing rating scale: This part is concerned with assessing the swallowing level and dysphagia manifestations following cerebrovascular stroke, it was derived from reviewing literatures based on the National Stroke Association (2018); the scale included seven levels ranging from Level 1 (swallowing is not functional) to Level 7 (swallowing is normal). Testing validity of the tools were reviewed by a panel of seven experts from the medical-surgical nursing staff at the Faculty of Nursing Ain Shames University to ascertain their face and content validity and relevance. Testing reliability of the proposed tools was done statistically by Cronbach’s α test. Cronbach’s α for patients’ structured interviewing questionnaire (tool 1) was 0.773 and for patients’ observational checklist (tool 2) was 0.754 which indicate high reliability of the used tools. The necessary official approvals were obtained from the administrators of the Ain Shams University Hospital for conducting the study. Letters of request were issued to them from the Faculty of Nursing at Ain Shams University explaining the aim of the study and its expected outcomes. Explain the aim of the study to the hospital director to apply this study for patients in neurological units. Explain the aim of the study to each patient and take the approval regarding participation in the study. Assured that the obtained information will be confidential and used only for the purpose of the study. The researchers approached the patients individually at the neurological inpatients units at the Ain Shams University Hospital, explaining the purpose of the study, and the importance of the swallowing training program to improve their swallowing level. Patients who were willing to participate were included in the study after obtaining their written consent, after informing them about their rights to refuse or withdraw at any time. Confidentiality of all information was secured. The study maneuvers could not cause any harmful effects on the subjects. Professional help was provided to all participants whenever needed. A pilot study was carried out on 10% of the total number of the study sample to test the applicability, clarity, and efficacy of the tools, then the tools were modified according to the results of the pilot study. Those patients were excluded from the study. The tools were developed by the researchers based on reviewing the recent and related literature. Data collection for this study was carried out in the period from June to November 2017. The methods of teaching used were lecturing followed by focus group discussions in addition to audiovisual materials and practice. Two tools sheets were used to assess dysphagia following CVS patients. Once the approval was taken to carry out the study, the researchers started to collect data and implement the program in the following way. At the beginning of the program, the studied patients should be assessed by researchers regarding their oral motor structures and reflexes. Then, dysphagic stroke patients receive a booklet about swallowing training program during their hospital stay in the neurological inpatients units at Ain Shams University Hospital, which is illustrated and applicable by two researchers, and after program implementation the researchers assess dysphagia in stroke patients regarding their dysphagia manifestations and swallowing level with different food types. Training sessions were conducted by the researchers which are divided into three sessions; about one hour and half per day (3 days per week) for 8 weeks. Swallowing training program: a booklet in Arabic language, based on recent medical and nursing knowledge derived from Kumaret al. (2014); Arnold (2016); Barer (2017), it gives insight about stroke and its possible effect on swallowing, the levels of food consistency given to the dysphagic stroke patients according to his/her swallowing level, food to be avoided for dysphagic patients, and steps of feeding the dysphagic patients. The first session: in which patients’ structured interviewing questionnaire is filled by the researchers and an overview about stroke and its possible effect on swallowing. It took about 30 min. The second session: included the levels of food consistency according to the patients’ swallowing abilities, strategies about foods that must be avoided for dysphagic patients, and the demonstration of the compensatory postures to be used during feeding. It took about 30 min. The patients were advised to carry out the swallowing training about five times per day. Furthermore, the family members were advised to be present at the side of the patients during each meal. It was given in about 1.5 h.
There remained three observations carried out through three consecutive days, whereas each observation took about 15 min for one patient. The researchers were available in the morning and afternoon shift 3 days per week for 8 weeks in parallel. The patients were handled the program booklet, with some explanations from the researchers regarding its importance. At the end of the program, its effectiveness was evaluated through observations of patients’ swallowing levels related to compensatory techniques with different food types. Presentation: this method has greater possibility of tasks being completed on time as well as a greater potential lesson to be executed as planned. Group discussion: this method of teaching has the greatest potential to build patients’ self-esteem and therefore enhance their performance. All data were collected, coded, tabulated, and subjected to statistical analysis. Statistical analysis is performed by the statistical package SPSS (SPSS Inc., Chicago, Illinois, USA); also Microsoft Office Excel is used for data handling and graphi graphical presentation. Qualitative categorical variables are described by percentage and proportions. Descriptive statistics are used to analyze the response to individual items and the respondents’ characteristics. χ2 and P value test used to test correlation. The data in [Table 1] shows the frequency distribution of the demographic and clinical data of the studied sample, whereas 45% of the studied patients were above 60 years old and 62.5% were male. Regarding the type of stroke, the majority of the sample (87.5%) had ischemic stroke. The percentage dysarthria was alike (60%). More than two-third of the patients (75%) had no previous CVS. The prescribed diet of 92.5% of the sample during their hospitalization was liquid. [Table 2] represents frequency distribution of the oral motor structures assessment of the studied sample. Lip assessment revealed that 62.5% of the patients had symmetrical roundness of lips and only 12.5% had right deviation of lips. The majority of patients (87.5%) could stretch their lips, and 62.5% could close their lips. Ninety percent of patients could seal their lips tightly, whereas only 10% could not. In relation to, tongue assessment, 40% of the patients had symmetrical movement of tongue to both sides. On the other hand, a symmetrical movement of tongue to the right side and left side was done by 30% of the patients. Moreover, the majority of the studied patients 95% could move their tongue downward toward the chin and 87.5% of patients could elevate their tongue to the upper teeth. 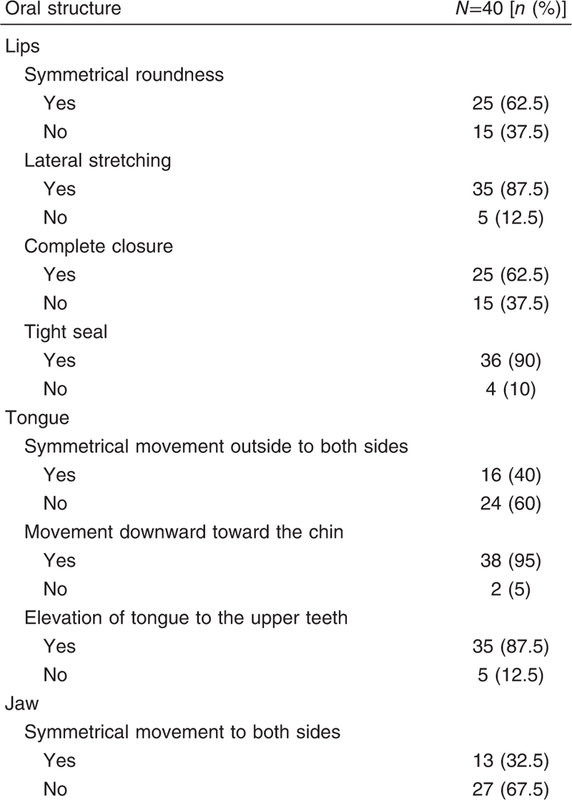 As regards jaw, 62.5% of the patients could not move their jaw to both sides and 32.5% could move it to both sides, but only 5% of the patients had asymmetrical movement of the jaw to the right side. [Table 3] shows the assessment of swallowing, gag reflexes, and voluntary cough. About 75% of patients had complete laryngeal elevation, whereas 72.5% had intact gag reflex, regarding voluntary cough, 62.5% had ineffective cough, and only 37.5% had an effective cough. [Table 4] shows dysphagia manifestations of the sample associated with the types of food. During the first observation, 57.5% of the patients and 7.5% had pocketing with potatoes and with the teaspoon of water, respectively. 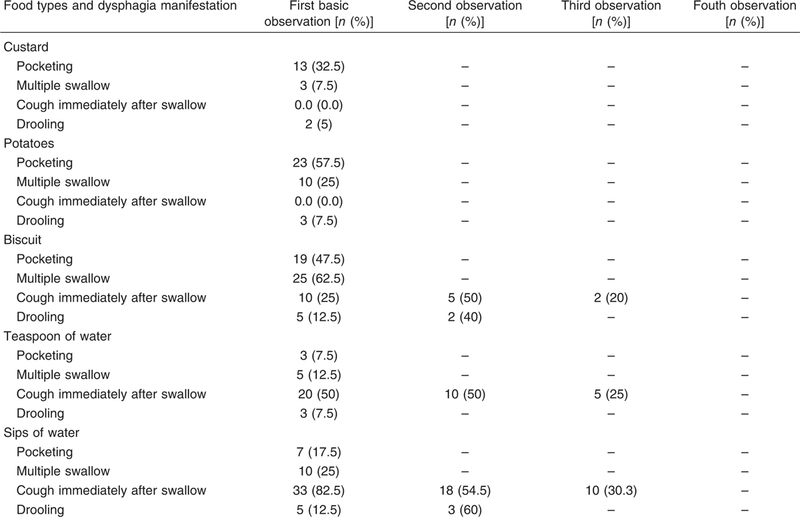 In relation to multiple swallow, 62.5% of the sample suffered from it with the piece of biscuit and it was observed in 7.5% of patients with custard. The majority of the studied patients had cough immediately after the swallow of water from a cup (82.5%), although no patients had this problem neither with custard nor with potatoes. It was also seen in the basic observation that 12.5% of the patients drooled with the piece of biscuit and while drinking sips of water from a cup. In the second observation, the number of patients who coughed immediately after drinking water from a cup was decreased to 18 patients and five patients after eating the piece of biscuit. With the teaspoon of water, 50% had this problem in the second observation, while two patients out of five drooled while chewing a piece of biscuit and three patients had it with swallowing sips of water. As regards the third observation, there were only two patients coughed after swallowing a piece of biscuit, 10 patients with the sips of water and five patients with the teaspoon of water. No patient drooled in the third observation. By the fourth observation (9th day), the studied sample had no cough immediately after swallowing water or biscuit. [Table 5] shows the patient’s swallowing levels related to compensatory postures and food types. Regarding the first basic observation, the ability of 95% of patients related swallowing of water from a cup was at L3, and 87.5% at the same level with swallowing a piece of biscuit. On the other hand, less than two-third of the patients (60%) were at L7 with custard. 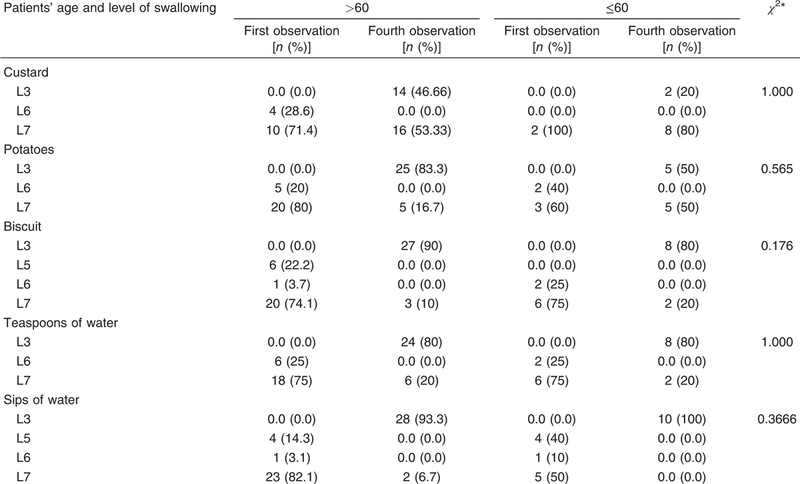 In the second observation, some of the patients’ swallowing ability improved, whereas 71.7% of patients, were at L4 while swallowing biscuit and sips of water. As regards swallowing potatoes, 33.3% of patients were at L5 and 13.2% of the sample improved to L5 while swallowing water. It can also be seen that normal swallowing during the second observation was 25% and 15.8% of patients’ drinking water through a spoon or a cup, respectively. Regarding the third observation, while eating potatoes there were 33.3% of patients at L4 and L7, respectively, whereas 28.6% of the patients were at L4 with biscuits and 39.5% were at L5 while drinking water. In relation to custard swallowing 37.5% and 14.3% of the patients in relation to biscuit eating were at L7. The fourth observation for dysphagia manifestations, the present study revealed that about more than two-third of the studied patients during their swallowing for potatoes, custard, teaspoon of water, eating biscuits, and sips of water were 76.7, 75,75, 74.3, and 73.7% reached at L7 (normal swallowing), respectively. [Table 6] shows a comparison between patients’ age and swallowing levels in the first and fourth observation. There were no statistical significant difference in relation to age and difficulty of swallowing different consistency of food and liquid. In the first observation, 80% of patients were below 60 years and 90% of patients above 60 years were, respectively, at L3 with swallowing biscuits. All patients below 60 years were at L3 with drinking water from a cup, while 93.3% of patients above 60 years were at the same level with drinking water. In the fourth observation, only 50% of patients below 60 years reached L7 with sips of water from a cup, whereas 82.1% of the patients above 60 years reached the same level with water. Regarding returning to normal swallowing of biscuits, 74.1% of patients above 60 years and 75% of patients below 60 years reached L7 with biscuits. Abdella (2016) who stated that the prevalence of stroke in men is higher than in women and its risk doubling with age above 60 years in both gender. That is due to the arteriosclerotic changes that occur in the brain with aging, this is accompanied with one or more of the modifiable risk factors of stroke (Weber and Kelley, 2018). On the other hand, increased prevalence of stroke with advanced age results in a high prevalence of dysphagia (Hinkle and Cheever, 2014). In this study, the majority of studied patients had ischemic stroke, this is in the same line with Paik and Wolff (2017), who reported that the most common type of stroke in his study about factors affecting the quality of life of CVS patients was ischemic stroke accompanied with dysphagia in the acute phase of hospitalization. Moreover, some researchers documented that the most important factor to determine the prognosis of dysphagia depends on the size of the stroke lesion, so that the larger size of stroke leads to more disruption of the cortical area involved in swallowing and the more likely a patient is to develop swallowing problems (Royal College of Physicians, UK, 2016). Joundi (2017) who indicated that there is a strong correlation between dysphagia and speech impairments. In this respect by the American Stroke Association (2017) who documented that dysarrthria-slowed, slurred, and/or imprecise speech is a clinical indicator that can signify dysphagia. As regards reflexes, most of the studied patients had intact gag reflex. According to O’Neil et al. (1999) gag reflex is less sensitive than bedside assessment in detecting dysphagia in acute stroke patients; however, an intact gag reflex may be protective against longer term swallowing problems and the need for enternal feeding (Chulay and Suzanne, 2010). This is parallel to Kitchener et al. (2012) who mentioned that the integrity of gag reflex provides no salient information about swallowing, and as such determination of oral intake should not be based on this sole feature. Although more than half of the studied patients had complete laryngeal elevation and dysphagia, this is supported by Carr and Shepherd (2012) who emphasized that the patient may be silently aspirated and have difficulty in triggering an adequate pharyngeal swallow. The present study findings revealed that more than one-third of the studied sample had coughing immediately after the swallow more frequently with drinking water and less frequently with eating biscuit. This is due to the pathology of stroke which affects the oral muscle control and make swallowing of thin liquids more difficult than swallowing solids. When patient coughs after swallowing food or liquid, it means that the cough reflex is intact and it protects against aspiration (National stroke association, 2018). On the contrary, Arnold (2016) found that aspiration may occur silently even with intact cough reflex. In addition, more than half of the studied patients had pocketing with puree potatoes related to abnormal tongue function and/or poor control of cheek muscles. Besides, many patients had multiple swallow with biscuits due to delaying of oropharyngeal reflex and only few patients had drooling resulting from poor muscle tone around the lips. After implementing of the swallowing training program, the results of the present study showed that more than half of the studied patients had an improvement in their swallowing level regarding different food consistencies; these findings were supported by Joundi (2017) who documented in their study about the rehabilitation program which include positioning, oral motor range of motion exercises, and adjusting bolus consistency reach patients suffering from dysphagia following acute ischemic stroke to normal swallow (level 7 at the swallowing rating scale). Furthermore, regarding the previous findings also in the same line with Chulay and Suzanne (2010) and Carr and Shepherd (2012) who found that return of swallowing to normal level after dysphagic stroke is associated with educating patients and family about how to use the compensatory postures and how to perform oral motor exercises. Regarding compensatory postures, they maximize safe swallowing and minimize the risk and symptoms of aspiration by controlling the direction and the speed of bolus flow through the mouth and the pharynx. Besides, the exercises of the lips, tongue, jaw, and cheeks are used to increase the strength, coordination, and range of motion of labial, lingual, and mandibular musculatures (Hinkle and Cheever, 2014; Grodner et al., 2017). 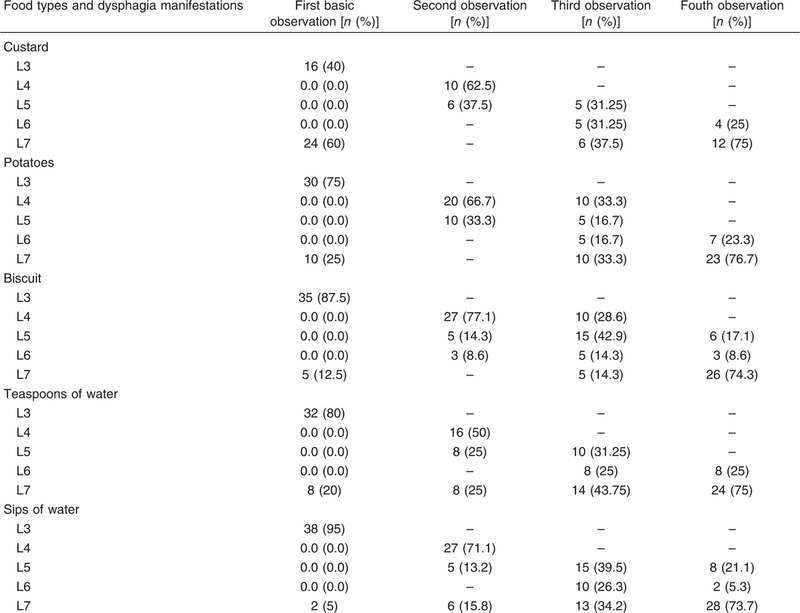 Finally, it seems logic to say that educating the dysphagic stroke patient and his/her family member has a role in increasing the safety of swallowing and contributing in preventing complications related to dysphagia. Dysphagia occurs in the first 48 h after acute attack of CVS. The swallowing training program was effective in improving more than two-third of the studied patients’ suffering from dysphagia following CVS. Finally, the nurse has an important role in: early detection of dysphagia, in teaching and reinforcing information about compensatory postures and oral motor exercises for the patient and his/her accompanied family member. Develop continuing in-service training programs for nurses who work in the neurological units about the assessment of dysphagic patients, the compensatory postures, and oral motor exercises to be carried out with dysphagic patients. Establish a multidisciplinary team for dysphagia management including a nurse, speech–language pathologist, dietician, and a neurologist. Develop a system of in-service training programs for nurses about: swallowing anatomy and physiology, swallowing process, effect of stroke on swallowing, manifestation of dysphagia poststroke, and the nursing role in managing the dysphagic patients. Abdella MA (2016). Factors affecting quality of life for patients with cerebrovascular stroke [master thesis], Faculty of Nursing, Ain Shams University. American Agency for Health Care Policy and Research (2016). Diagnosis and treatment of swallowing disorders: dysphagia in acute care stroke patients. Available at: http://www.ncbi.gov/. [Accessed date 2018 Jan 15]. American Stroke Association (2017). Assessment of swallowing: a useful screening tool for dysphagia after acute attack of cerebro-vascular stroke. Available at: stroke.ahajournals.org/content/30/2/28. [Accessed date 2017 Nov]. Amy S, Collins B (2015). Patient safety and quality: an evidence-based handbook for nurses. Available at: http://www.ncbi.nlm.nih.gov/books/NBK2683/. [Accessed date 2017 Dec]. Arnold M. (2016). Dysphagia in acute stroke: incidence, burden and impact on clinical outcome. Available at: http://journals.plos.org/plosone/article?id=10.1371/journal.pone.0148424. [Accessed date 2018 Jan]. Barer DH (2017). The natural history and functional consequences of dysphagia after hemispheric stroke. Available at: https://www.researchgate.net/…/20591051_The_natural_history_and_functional_conseq. [Accessed date 2018 Jan 15]. Carr J, Shepherd R (2012). Stroke rehabilitation guidelines for exercises and training to optimize motor skills. Available at: http://www.caregiver-information.com. [Accessed date 2018 Jan]. Grodner M, Long S, Deyoung S (2017). Foundation and clinical applications of nutrition: a nursing approach. 3rd ed. London: Mosby Co; 501–504. Hebert D (2016). Canadian stroke best practice recommendations: stroke rehabilitation practice guidelines. Int J Stroke 11:459–484. Hines S, Kynoch K, Munday J (2016). Identifying and managing acute dysphagia are effective for improving patient outcomes. Journal of neuroscience nursing 48: 215–223. Hinkle J, Cheever K (2014). Textbook of medical surgical nursing. 3th ed. Philadelphia, PA: Lippincot Williams & Wilkins; 43–55. Joundi RA. (2017). Predicators and outcomes rehabilitation program of dysphagia screening after acute ischemic stroke. Available at: http://stroke.ahajournals.org/content/suppl/2017/03/08/STROKEAHA.116.015332.DC1. [Accessed date 2017 Nov]. Kim B (2015). Role of the registered dietitian in dysphagia assessment and treatment. Can J Diet Pract Res 66:1–5. Kitchener N, Hashem S, Wahba M, Khalaf M, Zarif B, Mansoor S (2012). Critical care in neurology, online text-book. Available at: http://pdf.flyingpublisher.com/FPG_007_CriticalCareinNeurology. [Accessed date 2018 Jan]. Kumar S, Doughty C, Doros G, Selim M, Lahoti S, Gokhale S, Schlaug G (2014). Recovery of swallowing after dysphagic stroke. J Stroke Cerebrovasc Dis 23: 56–62. National Stroke Association (2018). Dysphagia severity & outcomes scale post acute stroke. Available at: http://www.stroke.org. [Accessed date 2018 Jan 15]. O’Neil KH, Purdy M, Falk J, Gallo L (1999). The dysphagia outcome and severity scale. Available at: https://www.researchgate.net/scientificcontributions/30642451_Karen_H_ONeil. [Accessed date 2017 Nov]. Paik J, Wolff EA (2017). Dysphagia management strategies. Available at: https://emedicine.medscape.com/article/2212409-treatment. [Accessed date 2017 Dec]. Ramsey D, Smithard D, Kalara L (2013). 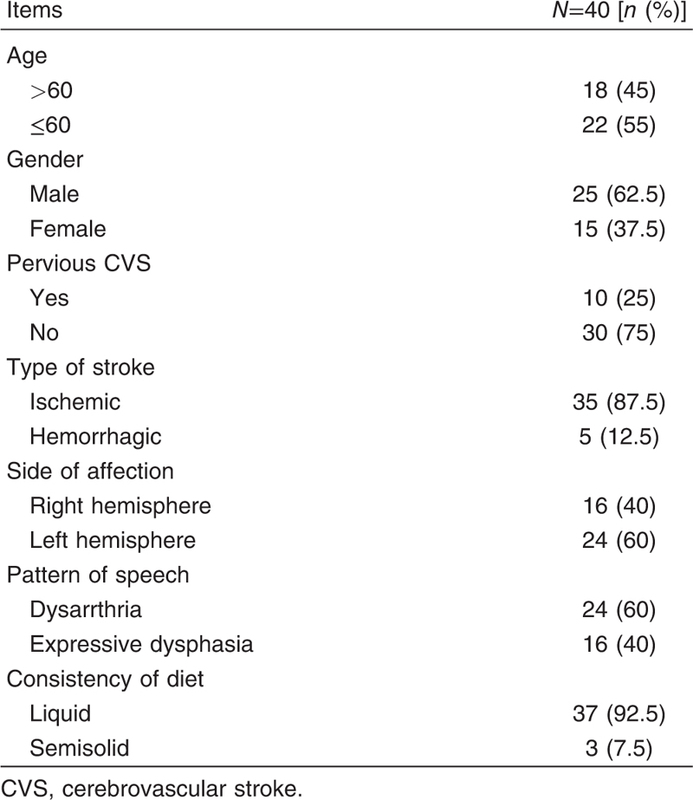 Early assessment of dysphagia and aspiration risk in acute stroke patients. Stroke Nurs Res 34: 5. Royal College of Physicians, UK (2016). Management of patients with stroke: identification and management of dysphagia through application swallowing training program. Available at: https://www.rcpe.ac.uk/college/rcp-stroke-guideline-fifth-edition-2016. [Accessed date 2017 Dec]. Ultra-Mobile Personal Computer Swallowing Disorders Center (2015). Nonsurgical treatments of swallowing disorders. Available at: http://www.upmc.com. [Accessed date 2017 Oct]. Weber J, Kelley J (2018). Health assessment in nursing. 5th ed. Tokyo: Lippincott Co.